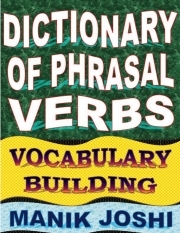 Description of "Dictionary of Phrasal Verbs (eBook)"
A PHRASAL VERB is made up of a Verb and an Adverb or a Preposition or both. Adverbs or prepositions which are used in Phrasal Verbs are called ‘Particles’. abide by -- to obey/follow a decision, rule, etc. answer back -- to make counter-argument | to give rude reply to your senior, an authority, etc. Reviews of "Dictionary of Phrasal Verbs (eBook)"